The Kamchatka Peninsula is one of the most active volcanic regions along the Pacific Ring of Fire. At least a dozen or more of all volcanoes there have currently active vents. A majority of the volcanoes are composite stratocones, and the youngest are located along the eastern half of the peninsula. Kliuchevskoi, one of the most active and renown volcanoes in the world, dominates Kamchatka's main cluster of volcanoes: the Kliuchi Group. 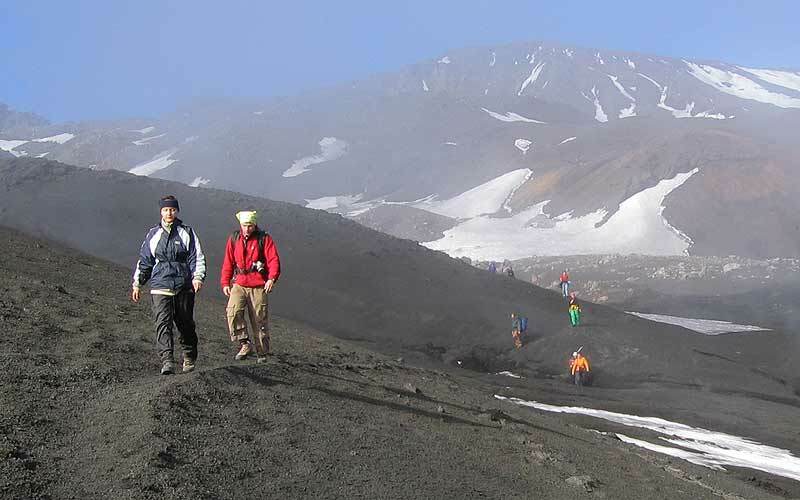 Two major volcanic ranges lie in a north, north-eastern line, the older, less active range occupies the central and western half of Kamchatka. The younger, more active belt begins at the southern-most point of the peninsula and continues upward along the Pacific coastline. 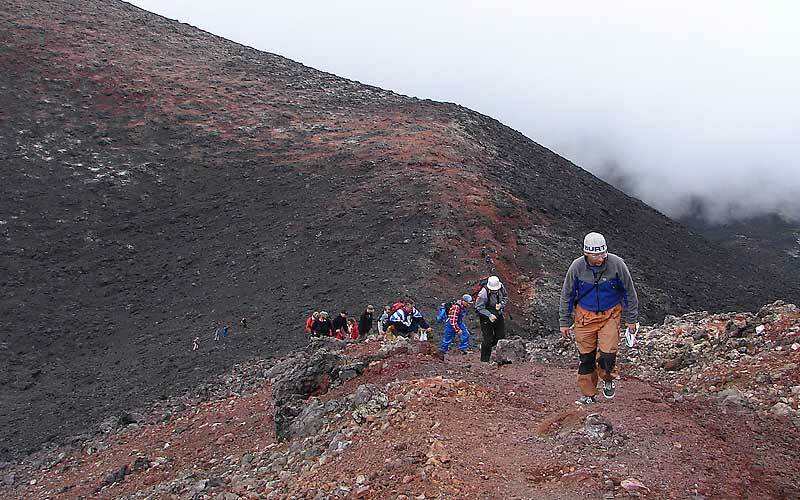 Kamchatka's immense volcanoes, calderas, lava flows and ash deposits are testament to this region's volcanic nature. 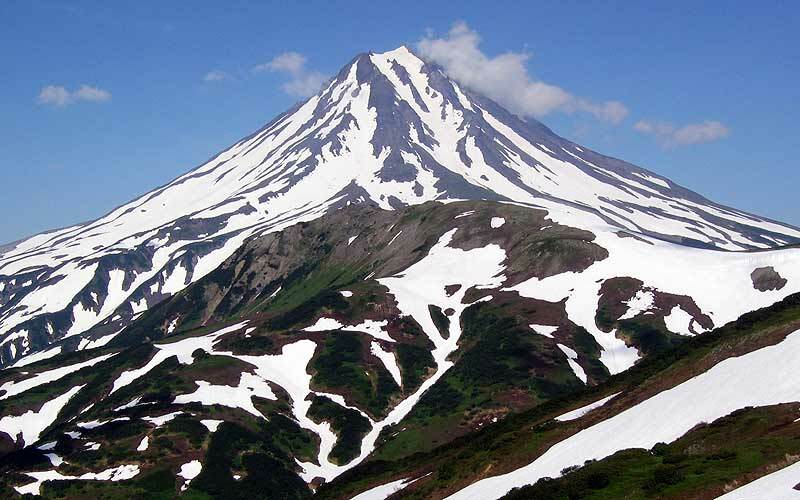 Kamchatka is the most spectacular region in Russia where wildlife nature was preserved. The land of fire and ice where a brilliant mountains, glaciers, hot mineral springs, active volcanoes and the mighty Pacific Ocean are found in a harmonious combination. Accomodation and food: accommodation in DBL rooms in the hotel (5 nights) and in tents or houses for the rest of the days; 5 FB (3 meals/day), 1 HB (breakfast & dinner), 1 BB (breakfast). 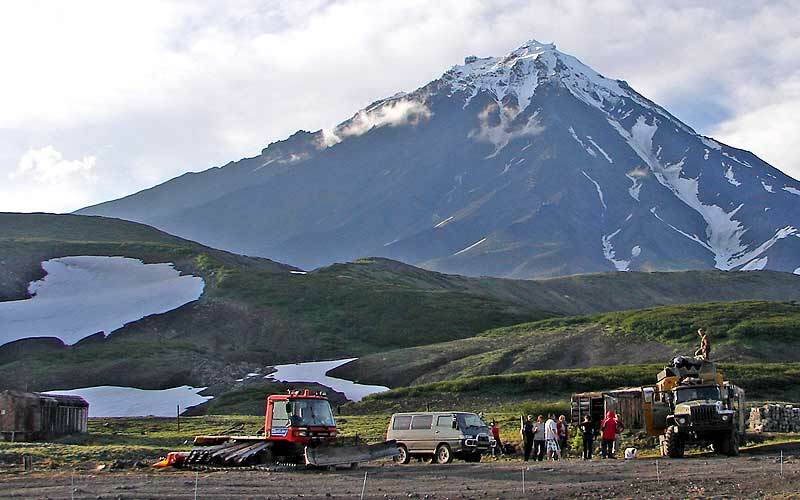 Tour highlights: Kamchatka is a peninsula comparable in size to Japan. It is washed by the Pacific Ocean and the Bering and Okhotsk Seas. Russia's large volcanic belt, made up of 29 active craters, stretches along its shore.Tolbachik volcano - its eruption of the century is called the Big Cleft Tolbachinsky eruption and it is considered one of the largest basalt eruptions ever known in the volcano belt of the Kuril Islands and Kamchatka. It lasted for one and a half years (July, 1975 - December, 1976) and was included in the list of the six most powerful cleft eruptions ever happened on the Earth. The lava has been thrown to a height of 2,5km in the skies. All surrounding woods have been buried and many rivers and lakes disappeared. Uzon Caldera (this is a term to specify a ring-like hollow) developed 40 thousand years ago on the site of a huge volcano destroyed by a set of bursting eruptions. The last cataclysm inside the kaldera (8,500 years ago) left its trace as a blasting crater about one kilometer in diameter. Gorely volcano is like chain from 11th craters lying one by one, with lakes, fumaroles, and also a great number (about 40) of secondary slag cones with lava torrents; in expose parts of ancient construction you can clearly study the process of transformation of volcano products, in particular, transformation of crumbly pumice. Gorely is great geologist object. 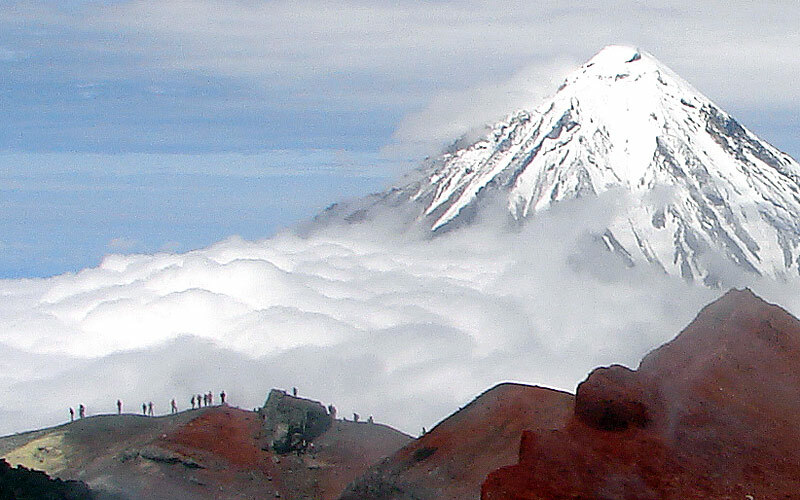 Mutnovski volcano is a compound volcanic massif of height 2323 m. above sea level. It has numerous and various fumarolic fields where one can see all different forms of modern gas-hydro-thermal activity with magnificent structures of volcanic sulfur of 2,5 m. high and 5 m. in diameter. Some of these structures contains rare minerals, such as markazite and metacinnabarite. Not far from the active craters, glaciers and lakes, thermal springs are located. 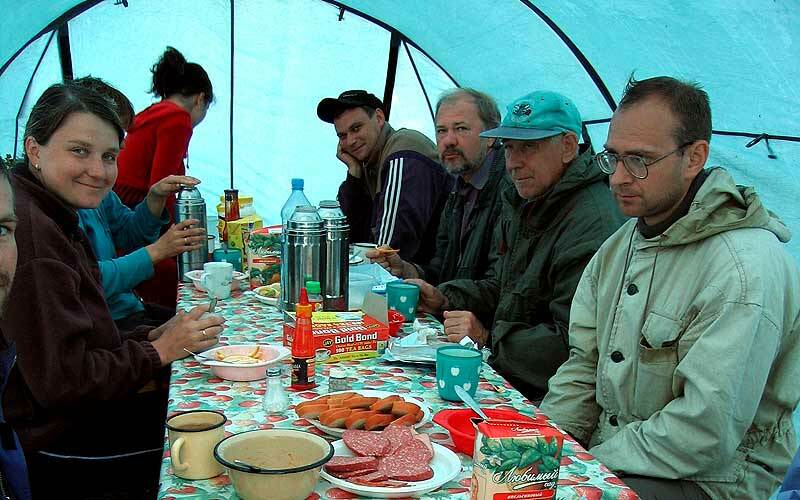 Necessary equipment: For climbing volcanoes you need water/windproof leisure wear and trekking boots, for overnights in the tent- sleeping mat and sleeping bag. You should also bring your personal first aid kit. rafting on the river Bystraya - 110 EUR p.p. 3-day rafting - 250 EUR p.p. (full board). For rafting you need 2 or 3 travel days more.